One would least expect to come across anything worthy to be called beautiful in a city like Glasgow. The largest city in Scotland is a stark and aesthetically iconaclastic monument to the Industrial Revolution. Not a place that one would normally associate with culture and arts, a sad stereotype that is gradually being debunked as the city tries to reinvent itself. One of the great treasures of this Scottish city is found in the Museum of Religious Life and Art, and ironically, it isn’t Scottish. The museum is the home of the eclectic Salvador Dali’s most famous painting, “Christ of St John of the Cross.” The beautiful surrealism of Dali’s masterpiece seems in sharp contrast to the grittiness of working-class Glasgow. It is pure irony to discover such Beauty in the heart of the Beast. Dali’s painting, which draws inspiration from the vision of the Carmelite mystic, St John of the Cross, takes the visual perspective of God - a “divine” bird’s eyeview of the crucifixion. In the painting, Christ and the cross are seen from above suspended over a port city where a fisherman tends his boat. But it’s not the perspective that makes it outstanding but the manner in which the crucifixion is depicted. There are no ugly nails to pin the body to the cross; visibly absent is the crown of thorns or any other sign of physical torment. The viewer is even spared from viewing the agonising expression of Christ who must certainly have suffered all the horrors of the crucifixion as his head hangs down, hidden from the view of all. Those who gaze on the Crucified Christ in faith are able to perceive that His hour of highest spiritual beauty—and glory—is a moment of utmost bodily degradation. We come face to face with the Love of God. It is only in the ugliness of the cross that we can see the extent and power of the love of God for us. In the humiliation of the Cross the Saviour brings near and makes visible the divine glory for we see in Him the ineffable love of God for sinners. 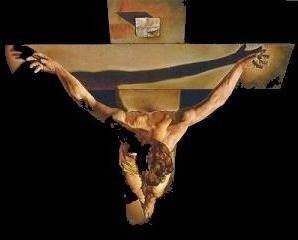 We were wretched, we were truly undeserving, and yet He suffered such pain, humiliation and agony at our expense. Whoever sees the cross and does not feel the tragedy of sin and the infinite love of God for sinful people is blind. Instead of horror and disgust, we see here the object of our adoration and adulation. This is where God committed the most subversive act in human history by converting the ugliness of the cross into the beauty by which His Kingdom would be established under the reign of the crucified Christ. We see Beauty in the Cross, because the Passion of our Lord gives a human face to the love of God for a fallen humanity. Our own sufferings, mysterious as they may be in both their origin and purpose, place us in the very heart of the Paschal Mystery. Suffering is not meaningless nor is it without purpose, and neither is our life. God through Christ has entered into this most alienating of human experience. Thus, on the Cross, we do not perceive the absence of God, but his powerful presence. Christ became what we are all afraid of and what we all deny: ugliness, suffering, pain, shame, vulnerability and failure. Christ became “sin” to free us from sin, the cosmic Scapegoat who reveals our worst and ironically the best in us, who lays bare our souls to those who would gaze long enough. Christ became the pleading image of what humans do to humans – so we could see it in stark outline, with the curtain of denial withdrawn. He became crucified so that we could stop crucifying. Christ became the crucified one who refused to crucify back, and thus stopped the inevitable pattern of death. Christ defeated our greatest and oldest enemy, Death, and threw down the gates of Hades, in one single swoop. No wonder, the great Russian Author, Dostoevsky, had come so close to the truth, when he claimed that, “Beauty will save the world.” Indeed He has! Like the Mother of Jesus and the Beloved Disciple who faithfully stood by the cross whilst others fled, we too are privileged to perceive the beauty and the glory of the Lord; a beauty and a glory however that is veiled in the ugliness of a tortured body, the degradation of poverty, humility, and vulnerability of the Crucifix that hangs before us and in the Sacrament of the Cross, the Eucharist. Today, there is no Eucharist. As St. Thomas reminds us that the Eucharist is the Sacrament of the Lord’s Passion, the figure that points to the reality: “The figure ceases on the advent of the reality. But this sacrament is a figure and a representation of our Lord's Passion, as stated above. And therefore on the day on which our Lord's Passion is recalled as it was really accomplished, this sacrament is not consecrated.” The bloody sacrifice of the Cross is what we witness today, whereas tomorrow we will re-enact in that bloodless sacrifice of the altar, where once again, the Lord’s Body and Blood would be offered at the celebration of the Easter Mysteries to sanctify and save the world. Habeas Corpus: You Have the Body? In the Empty Tomb, we "See"